You are currently browsing the archives for the NHRA category. 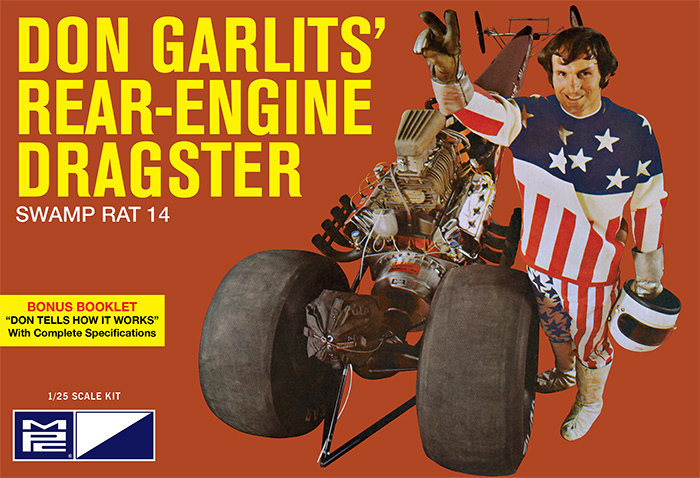 Don Garlits’ Swamp Rat 14 Rear Engine Dragster Features Bonus Materials From MPC! 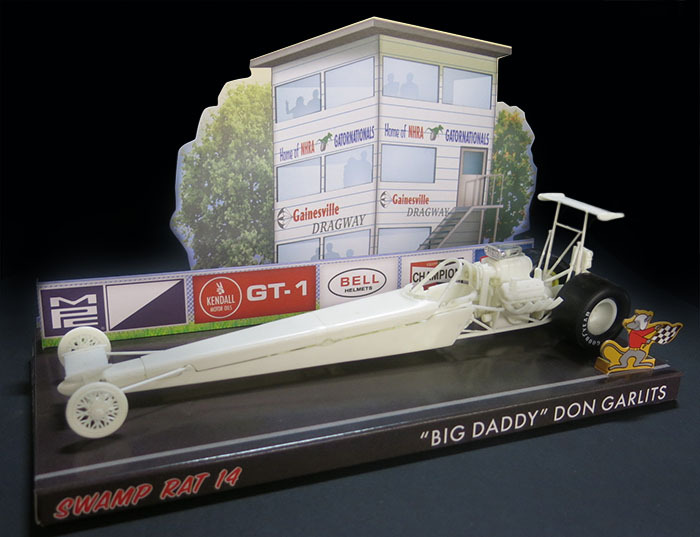 You already know that we released drag racing’s top on-track duo, Don Prudhomme’s “Yellow Feather” and Tom McEwen’s 1972 rear engine dragster, but we’re now set to reissue the Big Daddy of them all, Don Garlits’ successful Swamp Rat 14 dragster! This is the one that pioneered the rear engine setup as we know it today. As with all of our Retro Deluxe kits, we’ve gone to extra lengths to make this the best version of Big Daddy first rear engine dragster. 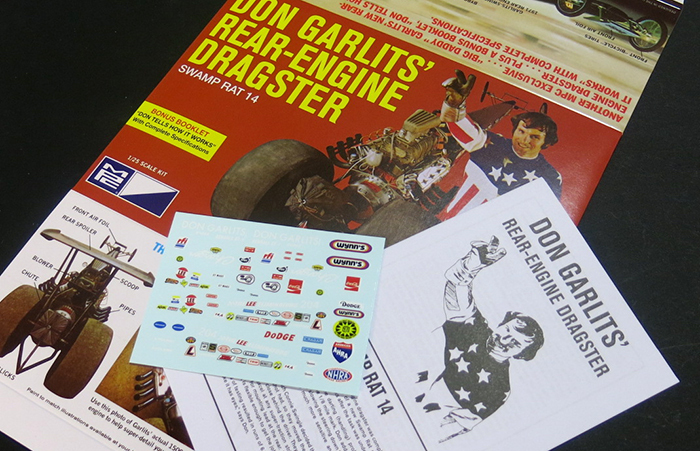 The kit features a bonus booklet with complete specifications, a recreated and more accurate decal sheet, pad-printed slicks and like the Snake and Mongoose kits, this issue come with a custom display base. While we’ve featured the famous tracks of Lions and Orange County in those kits, we’re featuring Garlits’ “home” track of Gainesville, which hosts the popular Gatornationals. As fitting the car, we’ve portrayed the Gainesville track in the proper era and this one is complete with the timing tower (note the kit shown is simply there for reference). Finally, we’ve corrected the car’s actual numbering. The original MPC issue noted the car as Swamp Rat 1-R, and we knew that Don successively numbered each of his real-life dragsters. So, we checked and direct from Big Daddy himself, he let us know that the car’s correct version is Swamp Rat 14. Make sure to get your kit and add to your growing collection of drag racing’s greatest legends – only from MPC! In any sport there is period of time you can look at and pinpoint the moment when the sport hit the big time. For drag racing, it was the late 1960s into the mid 1970s. That was when the sport experienced the perfect combination of extraordinary technological breakthroughs, record-breaking speeds, ground-breaking designs and a collection of legendary characters who were always ready to push the limits. It was that intoxicating mixture which took drag racing from a regional sport to one that captured the imagination of the nation. In the late 1960s, model kit building was an extremely popular hobby. Millions of model kits were manufactured each year to keep up with the demand. Model Products Corporation (MPC), a fledgling model kit company based in Michigan, took notice of America’s attention to drag racing and began to produce 1:25 scale model kits of these cars. Everything from funny cars and rail dragsters to pro stockers and gassers lined store shelves. Names like “Grumpy Jenkins,” “Mr. Norm” and “Dyno Don” adorned the packaging. AMT, Monogram and Revell also produced drag racing models kits, but by the 1980s, model building began to wane and the tooling for most of these models was put into storage. Today, vintage drag racing subject matter has become extremely popular in model kit and die cast circles. Many famous cars have been produced over the years, but it wasn’t until May of 2012 when Round 2, LLC announced the launch of their “Legends of the Quarter Mile” program that things really heated up. The Legends line was conceived to put a spotlight on the famous names and cars that put drag racing on the national map. Because of the diverse brands and categories under the Round 2 umbrella, “Legends” 1:18 scale die-cast replicas and 1:64 scale slot cars and drag sets are manufactured under the Auto World brand. Vintage model kits are also being reintroduced in 1:25 scale under the MPC and AMT brands. The release of Harry Schmidt’s Blue Max Mustang Funny Car as a 1:18 scale replica signaled the beginning of a wildly successful program that has captured accolades from racing fans and hobbyists alike. Several original teams and drivers have contacted Round 2, asking to have their cars immortalized in this exciting series! It was well before the first release, when work began to reintroduce several of the most popular drag racing model kits ever made under the “Legends” line. Some had been unavailable for decades and had been commanding big money on the collector market. The original tooling had to be scrutinized and in many cases, parts recreated. The artwork used to produce the decals in the original kits was long gone. Archival photos and other reference material was used to freshly replicate all the logos, badging and other markings in creating new, more detailed and accurate decal sheets. It was a challenge to find several of the original drivers. Some had moved on to other businesses and others had unfortunately passed away. Late in 2012, Round 2’s MPC brand reissued Arnie Beswick’s “The Super Judge” GTO and Connie Kalitta’s Bounty Hunter Funny Car model kits in the Legends of the Quarter Mile program. These deluxe 1:25 kits are available for the first time in decades and have additional extras added, like the additional window parts in the Beswick GTO molded in clear orange, replicating the real car’s tinted backlight. You’ll notice the attention to detail with the kits’ extremely popular pad-printed tire lettering and a connection to the past with the vintage box artwork. The latest Legends model kits include a special edition of AMT’s Ohio George Montgomery 1933 Willys Gasser and Carl Casper’s famed Young American front engine rail dragster, complete with bonus items and packaging that will delight any modeler or kit collector. For the Young American, Round 2 worked with Carl Casper himself to acquire a fantastic photo of the 1:1 car doing a wild pre-run burnout, to use on the packaging. It was a photo taken only seconds after the original one was used on the original release of the kit back in the 1970s. MPC’s team turned another photo Carl provided into a bonus card to include in the kit, featuring the specs of the car and a list of famous wins. For the latest Legends of the Quarter Mile news, updates and offers, check out www.autoworldhobby.com/Legends. Get Legends of the Quarter Mile products at hobby stores, racing and die-cast related stores and www.autoworldstore.com.